Yes, m’Lord, whatever you say – and have been saying ad nauseum for years. Yawn. Surely the House of Lords will welcome you with open arms as one of their own, then, right? Well, okay, but Monckton’s former role as science advisor to Prime Minister Margaret Thatcher meant he was a key figure in the Iron Lady’s climate policy, right? Well, that’s what he says. He appears to be the only one (that was there at the time) saying it. What we can confirm is that Monckton has a penchant for invoking Hitler and Fascism on his opponents. Like calling young, idealistic climate activists at the COP15 climate conference “Hitler Youth.” His recent tour has been marred by cancellations after he called Ross Garnaut a fascist. “Lord Monckton propounds widely discredited fictions about climate change and misrepresents the research of countless scientists. With zero peer-reviewed publications, he has declared that the scientific enterprise is invalid and that climate science is fraudulent … Over the last month there has been a great deal of coverage in the Australian media of the death threats and abusive emails that have targeted Australian scientists working on climate change. These threats are fuelled by misinformation spread by figures like Lord Monckton and the distorted coverage that they receive in the Australian media. As academics, we expect our universities to support us against this kind of abuse. We expect our universities to foster academic standards of conduct and argument. So Monckton is no climate scientists and not a Lord, despite his claims to the contrary. There’s likely a lot more where that came from. Get used to it. 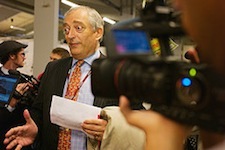 Pathetic character assassination of Lord Christopher Monckton. “character assassination” – how ironic. Along the lines of calling young people at COP15 “hitler youth” I suppose. People that don’t agree with/believe there is anthropogenic climate change need to put their support behind someone – anyone – besides Monckton. Characterize it how you wish, but he’s been exposed on numerous occasions as a fraud.